Posted in: General Market Thoughts. Tagged: $SPX, IWM, QQQ, Zweig Breadth Thrust. Crazy market the last two days but as long as dip buyers show up in the nick of time then that’s all that matters. It doesn’t appear that we’re going to get a follow-through rally tomorrow unless there is some kind of agreement reached in Washington because otherwise I really don’t know what else could initiate such a rally. Zweig Breadth Thrust rose to 60.20 today so it only needs to climb 1.31pts tomorrow to give us a Breadth Thrust. Could happen and would be an interesting side note to this nascent rally. The RSI on the 60min charts of the Q’s and IWM both closed above 70 today so these two are back in overbought territory and need a breather before pushing higher. Don’t know if that’s going to happen since these two have been in overbought territory most of the week without much reaction but if they did stall or roll over a bit tomorrow it wouldn’t surprise me. On Balance Volume isn’t confirming the latest move in $SPX or $INDU. In other words, OBV should have closed significantly higher today than it did back on the 23rd when both of these indexes closed lower, but that is not the case. We don’t have negative divergence yet but it is close and needs to be watched for the next few days to make sure that OBV gets back in sync with these two key indexes. Daily chart of $SPX showing that I’ve put a rising trend line in place. I would like to see the DI lines have another bullish cross soon because if not then it means that the ADX is not confirming the current new rally leg. Today’s candle is a Spinning Top which is another one of those indecision candles and could be a warning of a pending reversal. As with all of these, confirmation is needed and in this case that would be a close below today’s low at 1409.04 . Given that the 5,3,3 Sto is overbought, then we might see some give back tomorrow but a little give back in and of itself would not confirm a reversal, just a pause. Just something else to watch tomorrow. Posted in: General Market Thoughts. Tagged: $SPX, Zweig Breadth Thrust. Clearly the market spoke today. $SPX started the day down 10.21pts on the week and took back all of that in 6 1/2hrs while invalidating the Hanging Man reversal candle in the process. This indicates to me that market dynamics have in fact flipped from bearish to bullish and that last week’s rally was legitimate and not just a dead cat bounce/short squeeze. The icing on this cake would be a follow-through day as well as a Breadth Thrust per Zweig Breadth Thrust, but we are running out of time. Just have to see how things go tomorrow and Friday. Posted in: General Market Thoughts. Tagged: $SPX, P/C Ratio. Is a miss as good as a mile? With today’s 1398.94 close, we came within a hare’s breadth of the requisite 1397.68. Because $SPX did not close below 1397.68, then Monday’s Hanging Man reversal candle is not confirmed. Until proven otherwise, yesterday’s candle is still just a candle. If market bias and dynamic has truly flipped bullish, then there should be no problem with $SPX taking back all of its losses so far this week and it should do it tomorrow. As I said over the weekend, the markets reveal themselves on pull backs, and we are now in pull back mode. Is the market going to show strength and resume last week’s rally or is the market just going to keep heading south indicating that last week’s rally was just a big head fake and short squeeze? By Wednesday’s close we should have a much better idea about how this is all going to play out. I’m just wondering if yesterday’s extremely low P/C Ratio is going to haunt the market for weeks to come or if we’re going to resume the uptrend lickity split? Today’s action produced a red Hanging Man candle on the $SPX. I say red because these type of candles can come in red or green but the red candle is the more bearish of the two. Still, it’s just a candle until it gets confirmed. Should this candle get confirmed tomorrow, then it could lead to a reversal in this rally. Over the weekend I wrote about how markets reveal themselves in pull backs and we might just be setting up for a reversal now. However, I’m not really seeing it. Maybe that will change tomorrow but for now I think we get a bit more upside and maybe even a follow-through day before we pull back. But what do I know? Edit about 10mins later: Okay, well I should have looked at everything before I began today’s post. Anyway, today’s candle could have more meaning than I at first was willing to give it and that’s because of the P/C Ratio. I use the total P/C Ratio and it closed today at 0.63. That is the lowest reading this year. We had readings close to this at the March high and the September highs, but we have not had a reading this low in a long, long time. This means that no one was worried at all by today’s little give back and that everyone has moved onto the same side of the ship. This is never good and is a red flag. While I am normally skittish and paranoid, I’m more so right now. Let’s just see how it goes tomorrow. Just watch that tomorrow $SPX does not close below today’s low because that is the tell. Posted in: General Market Thoughts. Tagged: $SPX, $TRIN, 90% Up Day, AAPL, DIA, IWM, QQQ, RTH, SPY, XLF, Zweig Breadth Thrust. An indecision doji on Thursday, November 15th, had the potential of sending markets into a consolidation phase, which appeared to have been confirmed on Friday, the 16th with a 6.55pt rally. Considering that the RSI 14 had dropped to 27 and that we had two climax selling days, Wednesday the 7th and Wednesday the 14th, and we were headed into a holiday week, there was a good probability that we would get some upside in the week of the 19th but there was no indication that we would get the huge upside that followed. On Monday the 19th, we got a 1.99% rally in the $SPX on decent but not great volume. This rally gave us a 90% up day, a CCI ‘buy’ signal and set the stage for the potential of an IBD type follow-through day needed to confirm that market dynamics have changed and that a new rally leg would ensue. Friday’s rally does not, IMHO, qualify as a follow-through day. I’m basing this on the volume, which, if averaged out over a regular 6.5 hour session, would have been only 1.6billion shares. Plus, this mythical follow-through day should come with a gain of close to if not more than 2% with very convincing volume. If we’re going to get such a day, then it will have to come by next Friday, the 30th, or the signal will be deemed invalid. Further, all this crap about the Fiscal Cliff is simply crap. On a per capita basis, Red states get more Federal dollars than do Blue states. If you think the Republicans, who whine and cry about government spending, are going to kill the goose that lays the golden egg and turn off the money spigot then think again. It ain’t gonna happen. Oh yeah, we’re certain to get some more brinksmanship, but in the end disaster will be averted. Since the market topped out on September 14th, we’ve had several very convincing rallies, all of which failed and we just don’t know yet whether or not this current rally is different. Because we finally got climax sell signals/capitulation, this rally attempt has a better chance to succeed than have any previous attempts since the September high but for now we have to look at what happened this past week as just a dead cat bounce and a mega short squeeze. In fact, watching the ES near Friday’s close it appeared to me that I was witnessing forced buying, as in short covering, rather than organic buying. Hanging over the market’s head is the potential for a capital gains tax increases for stocks. This is not a certainty yet and the uncertainty may be enough to force the liquidation of millions and millions of shares. Historically, when capital gains taxes have been increased, the markets have dropped in December. The market reveals itself on pull backs as it lets us know if it has the strength to recover from the pull back or if it’s too weak and just rolls over and becomes a new decline. After this past week’s rally, it would be naive to think we’re just going to go parabolic without some kind of give back. Because we got extremely overbought this past Friday with a 90% up day and with a $TRIN reading at .31, I would expect a pause day for Monday, though, with the weekend in between, there may be other factors that influence Monday’s market action as in strong or weak retail sales. Still, we need some kind of a pull back next week so that we can see if the market has the strength to recover and start putting in a series of higher lows and higher highs. If we’re going to get a follow-through day, it must come by next Friday, the 30th. This will be a rally day of close to or exceeding 2% on huge volume. We get this and, despite the threat of a capital gains increase and any other bad news, the markets could be good to go into next March/April. There is a very strong potential for a Breadth Thrust per Martin Zweig. This occurs when Zweig Breadth Thrust rises from below 40 and then up above 61.5 in 10 sessions. ZBT has climbed from 35.76 to 59.67 in five sessions and if there is any kind of a rally on Monday ZBT may well rise above 61.5. But it doesn’t have to happen on Monday as the 10th session would be next Friday, November 30th. If this were to happen then, according to Mr. Zweig, it would mark the beginning of a new bull market. The last time that this came close to happening, at least that I remember, was in August of 2010. The fact that it didn’t happen had little impact on the market at the time and if it does happen next week it may not have much positive impact, either, but would be an interesting and bullish sign. Edit Sunday, November 25th: The only place I know of where you can find data for Zweig Breadth Thrust is over at FreeStockCharts.com. Just type in T2103 into the quote box and it will appear in the drop down menu. The markets are at a critical juncture with no clear direction, but we’re certain to have a better idea as to the market’s direction by the close of next Friday’s trading, if not sooner. My analysis indicates that the bottom is in for now and should endure. Personally, I would prefer that we’ve seen the bottom for this cycle and that from here we rally into next spring but it’s the market that makes the decisions and the market loves to make fools of those who attempt to divine its course. Q 60min chart which, with the RSI above 70, is showing the Q’s to be extremely overbought. Normally I would expect some give back which would allow the oscillators a chance to recycle but I have also seen times when the RSI has remained above 70 for several sessions before recycling lower. It’s just going to depend on how AAPL fares on Monday/Tuesday. Also, let this be a proxy chart for IWM, SPY, DIA, XLF, RTH, and several other sector ETF’s as the charts all look pretty much the same. SPX daily chart showing that it broke above the falling price channel. 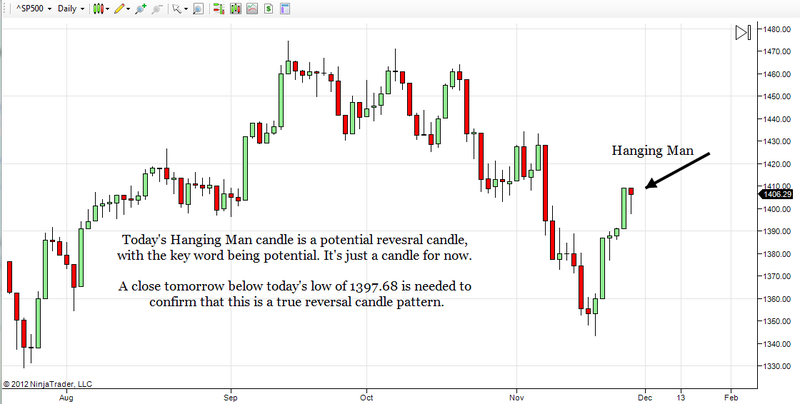 I tried to put a fresh up trend line on the chart but could not get the required three touch points using the candle bodies. When I can get those touch points, I will remove the falling price channel. The DI lines have now had a bullish cross. The strategy that many follow when this happens is to buy when the index, stock, or ETF in question closes above the high of the day that this bullish cross occurs. In this case, that would be a close above 1409.16. Also note on the chart that the 5,3,3 Sto is at very overbought levels. Add this to the fact that several other indicators are showing extreme overboughtness and this further suggests a pause day for Monday. The markets have a lot going for them heading into the early days of next week’s trading. It’s theirs to either build upon or to lose. Market participants will need to remain hypervigilant next week so as not to be surprised by either a continuation of this past week’s action or a resumption of the down trend that has dominated market action over the past several weeks. Posted in: General Market Thoughts. Tagged: $SPX. Well, $SPX is about to break out of the falling price channel that has contained the index for about 6 weeks. Just something to keep an eye on during Friday’s short session. Regardless of Friday’s volume, if $SPX can break out of this price channel, it would have to be seen as bullish going forward. Posted in: General Market Thoughts. There’s your text book pause day. Volume will drop off tomorrow and during the shortened session on Friday and this should favor the upside. Last year the markets came down pretty hard during this same week but now the markets seem to be trying to build a foundation from which to rally. If the markets do move up during the next two sessions, I hope we don’t get some kind of mega rally or just go parabolic. That would be good for a few days but could easily collapse. In a perfect world, the markets will move incrementally up or down or perhaps sideways until everyone gets back next Monday. If the market wants to rally Monday on good volume, I’m all for it. I just don’t want to get faked out this week and see everything blow up next week when the pro’s get back in front of their screens. I don’t think the market is going to release much more information in the remaining hours of trading this week and with that in mind I probably won’t post anything else until the weekend. Caveat would be a mega up day or a mega down day.